We continue our series on Women in Cannabis where we speak to women who are company or cultural leaders. They are writers, CEOs, and policy makers. Many are fueled by a desire to help those in need and have the chops to do it. Follow along this month as we present interviews with women internally at MedMen and at popular brands that make cannabis products for enjoyment, wellness, and even for our furry friends. 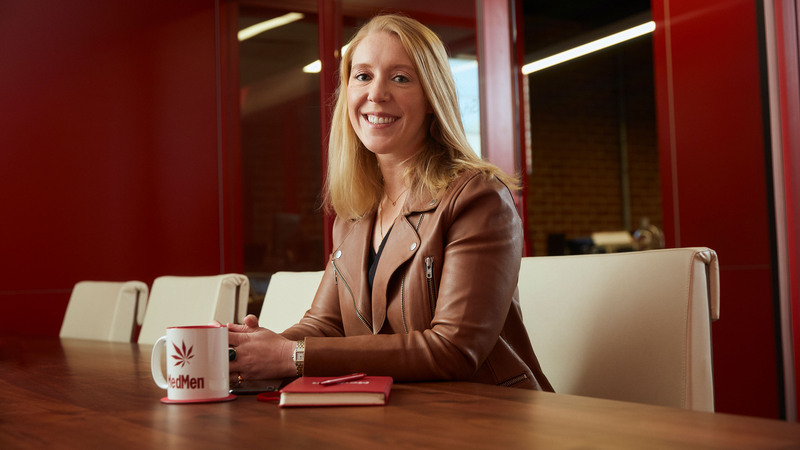 MedMen’s Vice President of Investor Relations, Stephanie Van Hassel, came to cannabis from the hedge fund world because she felt she could make a difference in this industry. Read how working in cannabis has influenced her personal life and what her hopes for the future of the industry are. I’m originally from Belgium. I grew up in Japan, moved to Singapore and then moved to New York when I was 16. Upon graduating Cornell University, I moved to Sydney, Australia where I held my first job. After Sydney, I moved back to New York and eventually Los Angeles two years ago to join MedMen. Prior to this role, I had worked in the hedge fund world. I’ve been in investor relations since 2006. At MedMen, I get to apply my more than a decade of experience to build something from the ground up, and that’s very exciting. I wanted to leave NY and was exploring new cities. My younger sister lived in LA so I decided to look at opportunities here. I was grabbing coffee with someone from Morgan Stanley and he mentioned “what about cannabis?” At first, I thought no way, coming from the hedge fund world, which is very traditional it didn’t seem viable. Then I came across this director role for investor relations online, and the job description was exactly what I was looking for. So, I thought, why not? What brought you to MedMen? Once I came in to meet with MedMen, I was really impressed with the caliber of people who work here and how passionate they are about the MedMen mission and vision. It is a rare opportunity to find work that is really meaningful, that has real impact on the world we live in. Being around such like-minded people is inspiring and I realized there’s no better time than now to seize this opportunity. I’m vice president of investor relations. That means I represent MedMen to the investor community and keep them informed of the company’s financial performance and business operations. I ensure they understand the mission and vision of the company and how we are executing on our plans to achieve this. The financial world is predominantly male, so I had been used to being in the minority. For me MedMen has been the opposite—I’ve never worked with so many women. It’s been the most diverse work place to date for me. On top of that, it’s been particularly interesting to learn how cannabis can benefit women—for cramps or anxiety, for example. Do you feel there are opportunities for women to grow in the cannabis space? Absolutely. Whether you’re in finance, retail or if you want to take a medical stance and do research... It’s such a nascent industry that there are so many opportunities to be had, especially for women. Trying to figure out what you want to do in life and what you want to achieve in your career are always challenges, but for me I’ve always wanted to be part of something where I felt passionate. I’ve always wanted to make a difference and I wasn’t really feeling that in the hedge fund world. Now, I am applying my experience and skills to help build a whole new industry, and that’s really exciting. We are changing the way the world views cannabis while creating economic opportunities and new jobs – that’s revolutionary. I wasn’t a regular user before joining MedMen. But in the last couple of years, I’ve been learning more about different products and their benefits and I have become a consumer. In fact, I use it every day. I use it particularly to help with sleep—I’m a big fan of the sleep pen by dosist. I love the Kiva Chocolate-covered Blueberries and their new Camino gummy line. My hopes are that we get to a place where cannabis is completely mainstream, that we stop sending people to jail for it, that we have safe and high-quality products sold in safe, high-quality spaces free of stigma. A place where people aren’t afraid to say they use cannabis—whether it’s for pleasure, for creative flow or for wellness. A place where we can conduct medical research to explore how much more it can help people. I would advise to network—there are a lot of different cannabis events. Learn what the different brands are and which ones you like, including the ones that are paving the way and figure out how to get connected to them. I also think particularly as a woman, be confident. You are where you are today because of your skill set and how hard you’ve worked. There’s no reason to shy away from anything.